Proven By Users offers surveys before (pre-sort) and after (post-sort) your card sorting study. The pre-sort survey is most frequently used to collect demographic data about the participants. For example: age, gender, job function, computer literacy, ect. These questions can help you discover if different populations think about your content differently. The post-sort survey is a great place to ask them about their experience with the card sort. Was it hard? easy? Collecting open-ended comments in the post-sort survey allows you to catch ideas the user has about the content that you might normally collect in an in-person card sort. Creating your survey begins by adding questions or static text to your survey. 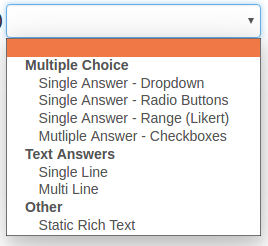 Proven By Users supports 6 different types of questions - and a Static 'Rich' Text option. 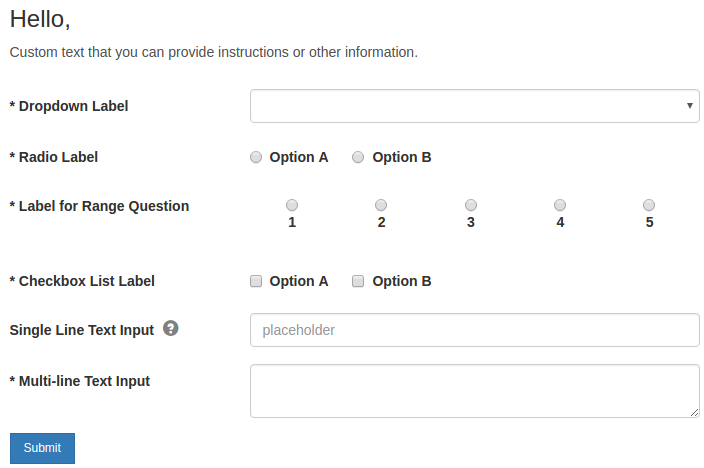 Each question type can be set as required and help can be added to assist the participant in answering the question. Multiple-choice questions also have options to randomize the order and change the orientation of the answers (vertically stacked or horizontal). The image below shows the various question types as they could appear in a survey. While building your card sort survey, each question added shows 4 icons to the right.